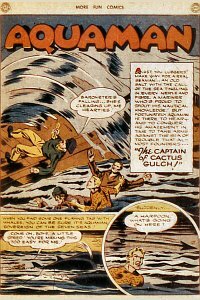 More Fun #100 (November 1944) - The Captain of Cactus Gulch! Aquaman runs across a ship whaling in restricted waters, and learns that the captain is totally clueless. This story refers to Aquaman's ability to communicate with sea life as "that mysterious magic known only to Aquaman and the dwellers of the sea he rules." The idea that it was telepathy didn't come along for quite awhile, as I recall... though I'll be sure to point out the first instance of that word. Cactus Gulch must be a really small town, as they report when local boy Peter Reeks gets promoted to second mate... Horace is reading "Two Years Before The Mast", which is (in my opinion) one of the most boring books ever written... Horace is too old to ship out as a beginner, so Peter suggests he buy a ship and go out to sea as captain. It's all part of Peter's plan to get away with illegal whaling... Peter justifies attacking Aquaman to Horace by saying that Aquaman is a dictator of the seas who is lying about the waters being restricted for whaling. Horace buys it... A swordfish comes to help Aquaman, but can't use his "sword" on the wire the thugs tied Aquaman with... Horace isn't convinced that Peter is using him until Aquaman helps him overhear Peter calling him a "blustering idiot" and talking about killing him. Finny Friends Report: Aquaman is playing tag with whales in the opening sequence. He gets a starfish to loosen the wires binding him when he's captured, then uses flying fish to board the ship. He has his whale friends bring the patrol ship faster. Captured/Knocked Out report: Aquaman is hit by the ship's boom while dodging thugs. Quotefile: Horace: "Barometer's falling... she's clearing up, me hearties!" and "Ho there, ye lubbers! Luff her rudder hard a-port to sta'board!" Isn't Cactus Gulch in Arizona? Weird setting for a story about a whaling ship. The location name must be a coincidence.